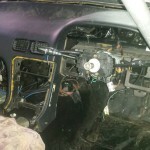 The next step was to tackle the wiring loom. 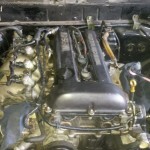 As the car originally had a CA18 engine, the loom was different. Adding to that, the wiring had been chopped and reduced to only the functions required for circuit work so many parts required for rally were missing. The easiest solution was to use the loom from the front cut. Before fitting to the car we did have to make some mods. 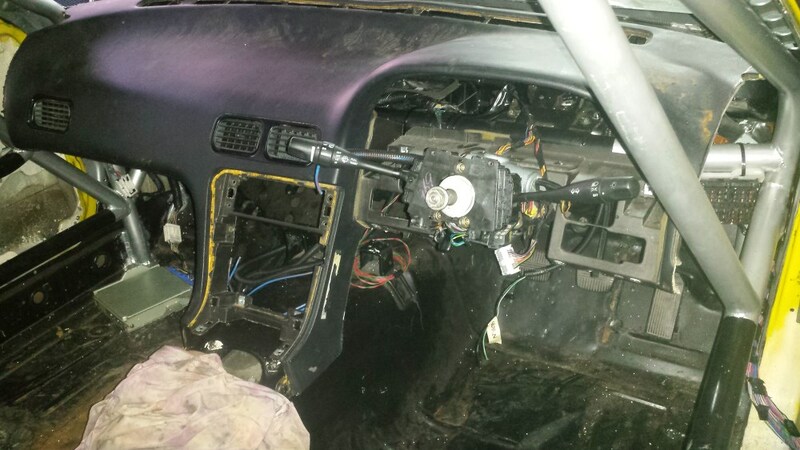 The electronic climate control, air conditioning ABS, stereo, air bag and pop up headlight wiring were all removed. We also had to carefully re-locate the position of the fuse box up to the dash level as the front cage leg bracing covers the original position in the rhs foot well. The loom was then fitted into the car awaiting re-connection. 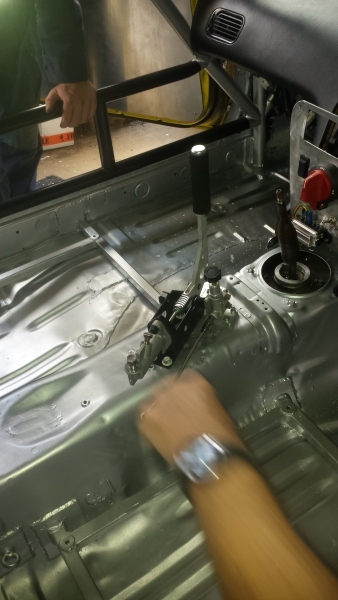 With the build progressing, we moved onto modifying the dash board to fit around the roll cage front legs. With the screen out, this is a much easier task. The dash was measured, marked and trimmed before bolting into position over the factory heater box. With everything in place, the major loom was plugged in and readied. Whilst inside the car, we also had to find a new mounting for the ECU. The cage bracing in the lhs foot well also obscured the factory mounting position. The factory ECU will be used initially to drive the engine, however the plan is to upgrade to programmable engine management in future. The engine and gearbox were installed as one unit, mating with the car from underneath complete with cross member, steering rack and power steering components. 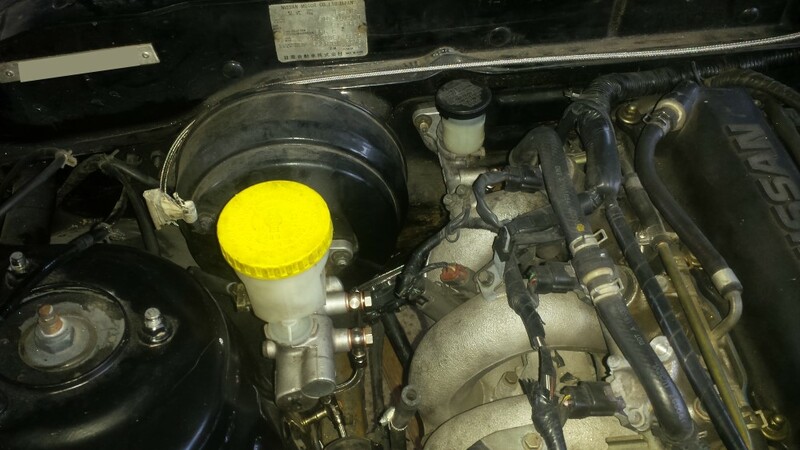 It probably goes without saying, however a new oil filter, plugs and synthetic oil were also done as part of the engine fit. Now with the major parts bolted in, our attention turned to the rear cradle and radiator at the same time. 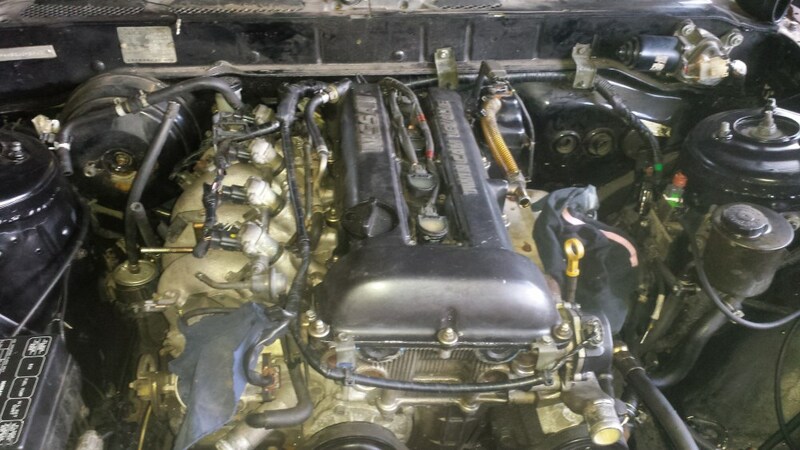 We’d received a decent sized aluminium radiator with the shell, however it was for the CA engine and so a new aluminium unit to suit the SR20 complete with electric fans was ordered and fitted. The factory radiator fan is a mechanical clutch type. With the fitment of the new engine cooling set up, wiring and relays to drive the fans were also fitted and pre-wired. The rear end was dropped out and stripped for inspection. 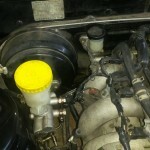 Finding loose, bent and missing driveshaft bolts straight away indicated further inspection was needed. We quickly found a new pair of driveshafts were required too. Added to our list was a tailshaft. The CA unit is a different length to the SR one and the centre carrier brackets were not supplied with the car. During the strip all the factory brakes including lines and handbrake cables all went into the scrap bin. We also discovered a dangerous mod during disassembly. Initially we thought the rear end had been converted to later model 5 stud hubs. We soon discovered that a 4 to 5 stud adapter kit (pictured above) had been used instead of doing it properly. These kits are dangerous enough on their own, let alone the poorly cut wheel studs and stripped and/or loose nuts. The crazy thing was this set up had been used for drifting and tarmac racing and was an accident waiting to happen! A replacement set of rear hubs was added to the list. With all the correct parts sourced, the rear cradle was reassembled. During re-fit to the car a set of aluminium locking collars were also fitted to solid mount the cradle to the chassis and eliminate rear end movement. After seeing what was in the rear end of the car, we turned our attention to the front. 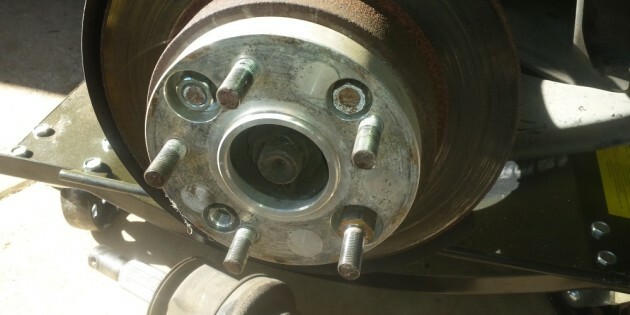 Behind the wheels we did find genuine 5 stud hubs, however more poorly cut wheel studs along with stripped/loose nuts and some 20mm spacers meant the front hubs also needed replacing. Added to that, larger Skyline R33 callipers had been fitted with the wrong brake rotors so the whole lot was removed. Two sets of lower control arms were strengthened in line with the rules and new ball joints pressed in. One set were destined for the spares crate whilst the other set went onto the car with a set of 4 stud hubs from the front cut. With all the hubs in place, brakes and hydraulics were up next. We soon discovered the clutch master cylinders were different and so the SR master cylinder from the front cut was fitted along with a new custom stainless steel braided line. Knowing the standard S13 brakes are not big enough, a set of Skyline R32 GTST 4 pot front and 2 pot rear aluminium callipers were fitted with new rotors and pads all round. 300ZX/Z32 brakes are also a common conversion to the S13’s as well. The whole set up is basically bolt on, save from some mods to the backing plates to accommodate the larger diameter rotors. With the factory ABS and plumbing removed, new custom stainless steel brake lines were run from the master cylinder to the wheels. In the rear circuit a Wilwood brake bias valve and hydraulic handbrake were also fitted to complete the stopping package. Once everything was test fitted and bolted into position, it was all removed to allow completion of the interior works and floor painting. Using our standard aluminium colour paint, the interior was given a couple of good coats ready for the interior fit out.